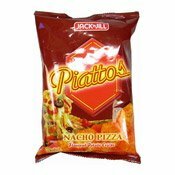 Just when you thought the delectable taste of Piattos couldn't get any better - it now comes in Nacho Pizza Flavour! 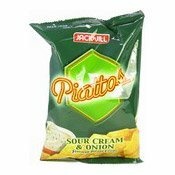 Piattos astounds you with the flavourful taste of pizza! Who wouldn't love that? Especially when it comes in Piattos chips so light and crispy - you'll definitely enjoy the flavour that is distinctly Pizza! With the tangy tomato sauce and rich nacho cheese. So go ahead, indulge in the flavourful slice, er.. chip of Piattos Nacho Pizza! Keep in a cool dry place and away from direct sunlight. Simply enter your details below and we will send you an e-mail when “Piattos Potato Crisps (Nacho Pizza) (珍珍薄餅薯片)” is back in stock!